Sometimes you want the beauty of your iPad Pro to shine, but you still want to keep it safe. 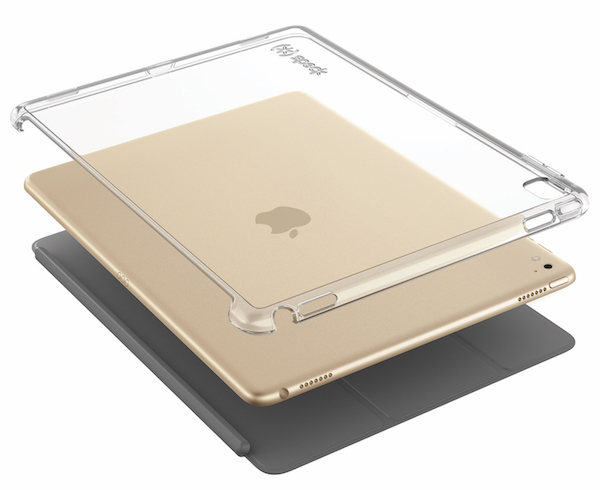 Our SmartShell Plus iPad Pro case is the best of both worlds, with a crystal-clear design that also protects against drops and scratches. This minimalist case fits snuggly around the back of the 9.7-inch iPad Pro or 12.9-inch iPad Pro and lets the tablet design shine through. What makes this iPad Pro case truly awesome is that it works seamlessly with the Apple Smart Keyboard and Apple Smart Cover (not included). You can use those covers on the front of the tablet and SmartShell on the back for all-around protection. We’ve paid close attention to detail with this case to make sure it protects your iPad Pro while not detracting from its design. SmartShell Plus is super-slim, so it doesn’t add any unnecessary bulk to your already thin iPad Pro. And yet it still has the protection you expect from Speck, featuring a dual-layer design with solid polycarbonate outside and a soft inner layer around the perimeter that absorbs shock from everyday drops. The power and volume buttons are protected with the soft inner layer, but still as responsive as if you didn’t have a case. The case has a scratch-resistant coating and our innovative materials resist turning yellow from UV light. Both features help keep SmartShell Plus looking crystal clear while you use it. Just as we do with all of our products, SmartShell Plus is lab tested for extreme temperatures, abrasions, drops, and everyday chemicals, like lotions and skin oils. The SmartShell Plus iPad Pro case comes in Clear and Black Onyx to match your style, whether you want the case to blend in with your iPad or add a darker flair. Grab one for your 9.7-inch or 12.9-inch iPad Pro from Speck while you can — these cases are selling fast! All The Protection You Need For Your New Apple Device + The Scoop On iPhone SE And 9.7-inch iPad Pro!